The going was rough and tedious as the United States Coast Guard icebreaker Polar Sea thrust through heavy ice in the Prince of Wales Strait last week in the western Canadian Arctic. 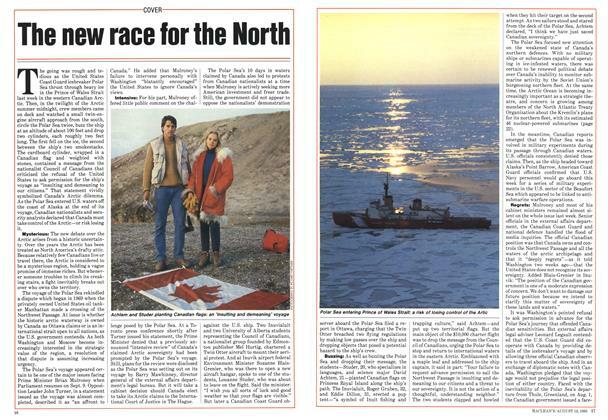 Then, in the twilight of the Arctic summer midnight, crew members came on deck and watched a small twin-engine aircraft approach from the south, circle the Polar Sea twice, buzz the ship at an altitude of about 100 feet and drop two cylinders, each roughly two feet long. For Terry Johnson, a rancher and owner of a road construction company in Oliver, B.C., it was the unhappy climax of a long and bitter relationship. Last week Johnson signed an agreement to sell his 460-acre cattle farm 10 km south of Penticton. 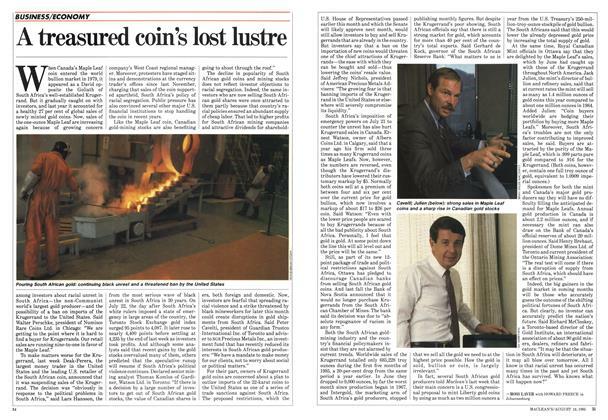 When Canada’s Maple Leaf coin entered the world bullion market in 1979, it appeared as a David opposite the Goliath of South Africa’s well-established Krugerrand. But it gradually caught on with investors, and last year it accounted for a healthy 27 per cent of global sales of newly minted gold coins. Surrounded by searing interracial violence in South Africa last week, a funeral was held for Elizabeth Khumalo, a 16-year-old black girl whom police had shot. But the crowd, which gathered in a tent in the dusty black township of Daveyton, 64 km from Johannesburg, had come primarily to hear the minister’s eulogy. He is in many ways the antithesis of Premier René Lévesque, whose eloquence and frenetic energy stirred the emotions of Quebecers, and many other Canadians, for nearly two decades. Almost everything about Pierre Marc Johnson—from the measured manner of his fluently bilingual speech to the way that the cut of his dark blue suits disguises a slight paunch—seems calculated to exude the calm assurance of the man who is the almost certain choice to succeed Lévesque next month as leader of the Parti Québécois and premier of Quebec. 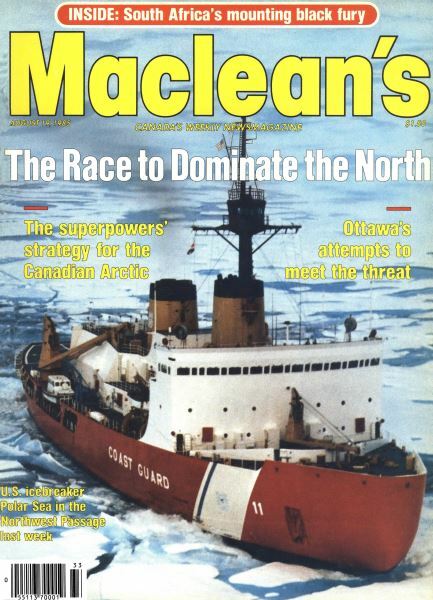 While the U.S. Coast Guard icebreaker Polar Sea tested Canada’s territorial claim to the Northwest Passage last week, there was mounting evidence that a far more serious struggle for supremacy between the superpowers may be developing in the waters beneath the arctic ice. 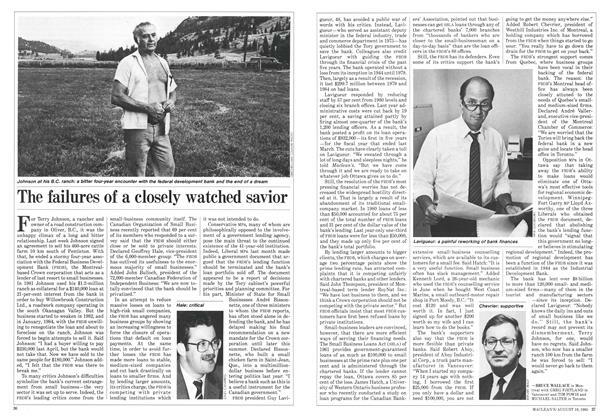 For the executives of Southam Inc., the Toronto-based national communications giant, the day’s events were both trying and tragic. Last Thursday, at a meeting in Toronto’s plush Four Seasons Hotel, shareholders overwhelmingly approved several antitakeover changes in Southam’s bylaws. His colleagues on the Law Reform Commission of Canada remember Jamaican-born Winston McCalla as a personable man and a conscientious lawyer who worked hard as coordinator of the commission’s study of criminal procedure from January, 1984, to the spring of 1985.